White Shine is finished!!! And itÃ¢â‚¬â„¢s off the hook! And we have a few images to prove it. We decided to extend the date to tonight 11:59pm. One more evening to win a brand new pair of Rossi Skis. Just wanted to let you guys know that the movie is done and has been shipped to ALLY for replication. ItÃ¢â‚¬â„¢s our best work yet, we tried something a bit different this year so make sure to check it out. And the graphics are incredible thanks to our good friends at Studio Element. The notables are of course JF Houle and Charles Gagnier. Both of these skiers have very explosive segments. The flow of the movie is where the moneyÃ¢â‚¬â„¢s at. When the credits roll over you just feel like watching over and over again. Go to http://www.whiteshine.com and click in the news section to check out the final teaser. On top of this you get over 2.5 hours of bonus stuff. You have a 30 min B footage segment (thatÃ¢â‚¬â„¢s almost one full movie), an hour long making of (co-produced by Bodhisatva films) with all the antics from the season, music videos from the bands in the movie, a few TV spots we got, teasers, ThomasÃ¢â‚¬â„¢s wakeboarding video and more... And click on whiteshine.com for more bonus stuff to come. The pre-order is going full steam! With less than 100 people who bought the movie last week, your chances of going home with a brand new pair of skis are pretty good. And if you are not ready yet you could still win a brand new Siver or Salomon outfit in the weeks to come. And for the last week you could win brand new pair of Smith googles and some D-structure swag. The deal itself is worth it: 30$ for the DVD (actually more like 2 films), a free t-shirt and a free full subscription to Freeskier. ThatÃ¢â‚¬â„¢s a 90$ value for just 26.99 USD or 30$ CAD. SO YOU HAVE TILL TONIGHT (MONDAY) 11:59 PM TO WIN THE SKIS. HURRY UP AND PRE-ORDER TODAY. 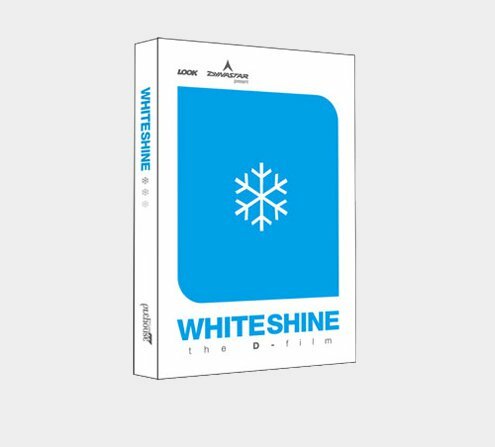 http://www.whiteshine.com to purchase the pre-order. As of Monday 11:59 PM all SUBSEQUENT pre-orders AND THOSE WHO HAVE NOT WON THE SKIS will be eligible to Win a brand new Siver or Salomon jacket and pants. Or a brand new pair of Smith goggles and a Salomon backpack filled with D-Structure goodies. Check out the news section on http://www.whiteshine.com to see the products. The winner will be announced tomorrow night in the news section and in the forum.